Father and Son adventures in High Altitude Balloon Image Exploration (Near Space Photography), using commercially available technology for both the flight system and payload. All images appearing in the JHABProject web site, unless noted otherwise, are the exclusive property of Ken or Joshua Nagel and are protected under the United States and International Copyright laws. The images may not be reproduced, copied, transmitted or manipulated without the written permission of Ken or Joshua Nagel. These copyright laws impose substantial penalties for infringement, and violators will be prosecuted to the full extent of the law. The use of any images or other materials included herein, in whole or in part, for any purpose other than the private purpose of viewing them online, including, but not limited to, copying, reproduction, publication (including on Internet Web Site including third party web pages by any means, including “hotlinking”, storage in a retrieval system (other than internet browser), manipulation (digital or otherwise), or transmitted in any form or by any means, electronic, mechanical, photocopying, recording or otherwise, is expressly prohibited without the written permission of Ken or Joshua Nagel. All artistic and moral rights of the author are hereby asserted. First off let me say well done. It’s a very cool thing you’ve done and inspiring in many ways. So much so that I’m asking my team here at The Capital Group (Irvine) to give duplicating this feat a shot as a team building exercise and would like some advice from you as we begin to embark on the effort. These are not engineers, they’re software developers and analysts who like to be challenged. Anything you can do to help us on the journey would be great. Please email me at bilr@capgroup.com with whatever advice you feel would be helpful. Thanks again. We’d be happy to assist in any way we can, sounds like a great idea. All of the parts can be found, around the house, Home Depot, and on the internet. I used Amazon a lot. Testing the Camera’s was one of our biggest challenges and took the majority of the time. Canon has a hack kit (CHDK) which allows you to load firmware from an SD card, and run either UBasic or Lua scripts. We also use the GoPro Hero for capturing HD video. It’s a great camera!. Check the parts list, I added a copy of the lua script we used. Since you said you have some developers, we could use some help with the script – we can’t figure out how to program some of the settings, so when you get to this point, email me again, and I’ll send you what I’m trying to do – maybe you’re guys can figure it out for us? Test everything a few times. So far we tested a lot and both flights we still had some minor problems. So we had redundant items, two gps’, two cameras, etc. Run flight predictions – our favorite site for this is http://habhub.org/predict/ – we ran predictions right up to the hour before our launch. Helium vs Hydrogen – you’ll hear two schools of thoughts out there – Helium is easier to work with, but is not a renewable energy source, Hydrogen will give you more altitude, is of course renewable, but extremely flammable. We went with Helium. Finally – set a goal – our was to reach 100K, and capture the entire flight. So far however we’ve only been able to reach the first goal, and only partially our second. Both flights, the canon’s worked great, but the GoPro captured the ascent but not the descent due to battery life. We’re still working on this. Have fun, please don’t hesitate to contact me during your process, be happy to assist any way we can. Bill, How’s the project going? We kicked off and are getting ready to do the real work. Targeting an April 15th launch (just for the humor aspect of it). Although we aren’t married to the date. If we’re ready early then we’ll re-consider. Frankly, we have no idea how long this will take. But we have 18 people who wanted to be involved and we all agreed to wait until after the holidays to really get going so I would suspect the next couple weeks really won’t amount to much. How are things going for you guys? Sounds great Bill — keep us posted – and if you need any help, don’t hesitate to ask! Great to see another HAB project across the pond going on! I’m doing a similar project over in the UK. Did my 2nd launch at the weekend and it went remarkably well. I’ve just updated my blog with a fair amount of data information (graphically represented) that may be of interest/help to you. Im from Edmonton Alberta, Canada, and we run a high altitude balloon program here that launches a a variety of scientific payloads, everything from particle detectors to atmospheric equipment. I just wanted to ask, because I can’t seem to see why, why exactly do you have that ring in-between the parachute and the payload? We use nothing similar to that. Is it for the parachute deployment, or what benefits does it provide? Hi Wyatt, good to hear from Canada, and other HAB enthusiasts. We added a tensioner to reduce tangle, and increase the parachutes envelope. As a skydiver, I got the idea from my rig. I had read others who had problems after burst, not getting the parachute to cleaning deploy. To be honest, our next flight we want to point a camera up at the balloon and parachute to see if the ring assists or not. So far from our decent rates we have a good assumption it is working cleaning. If you have results from your flight, we’d like to read more about it. Great project and site. We’ve been looking for a good device that can record accurate high-altitude. You seem to have yours down to the foot. What device are you using? We can’t find anything that works remotely that high. Thanks, Todd. Do you just use this information to track in real-time, or do you actually log the data you are receiving? If so, what device do you use to record the data? I’m looking at the Byonics equipment, and not sure exactly what to get. I’m interested to know what your setup looks like. I’m looking at the Byonics equipment but not exactly sure what to get. I need something that will log and record the data. The Byonics GPS 4 can get the altitude data we’re looking for, but doesn’t log it. I’m curious to know what your setup was for capturing altitude. I have the MT-300. Unfortunately, they don’t offer that anymore. If I were to buy something now, it would be the RTG (http://www.byonics.com/mt-rtg). But they don’t log data. That’s not how they work. What happens is the transmitter sends out a position report (you set how often). The report is picked up by different stations (digipeaters). There are TONS of them all over the country. The digipeaters upload the report to http://aprs.fi. You just go to aprs.fi, put in your callsign and SSID and it pulls up all the data. You can then download it and do whatever you want with it. This way, even if you don’t get the payload back, you can still get the data. For example, go to aprs.fi. On the right you will see a field called “Track callsign”. Type in mine, which is KJ4RSG-11 and click search. It will pull up the data from my last flight. To get the raw data you would just click on the link for “Raw packets”. It won’t show the data now if you click on it because it only holds it for two days. Here is a link to the latest version of our tracker: http://thetalon.smugmug.com/Misc/Space/More-Testing/19696778_tL84KT#!i=1781542161&k=zXHScNK. I’m researching amateur space flight and wondering how you manage to insure all of this? Something falling could be a bit of a liability. We have several ideas for this year- we concentrate on imaging, so we want to capture images on how different things react to the extremes of near space; can a cockroach survive the trip (SpaceRoach13), how does water react at 1% atmo, and we want to catch the sunset and a few others. Should be a fun year! The project is a touring video performance with live soundtrack which asks older citizens how they, after a lifetime on the planet, make sense of the human predicament: that we are standing on a ball which is floating through space and we don’t know why. I wanted to feature some images of Earth from space to give some context to their answers and as a periodic reminder to people in the audience that as they watch the performance, that they too are standing on this ball. I would be very happy to hear from you, the next performances are in Australia in March and I am currently gathering new material for those shows. We’d be thrilled to be a part of your project. I just watched the first video – it’s wonderful! “where there is love there is no law…” what a beautiful sentiment. I also live in Southern California (West LA) and would love to be able to pick your minds. Currently I am working on SSTV broadcasts from my first ballon but would love to be able to learn the ropes from someone who has done this before. Is there a method I can contact you all. Your site is filled with great tips. Hi Ed, you can reach us at 4nagels@gmail.com. SSTV launch would be interesting to see, happy to assist in any way, and share info. the 2014 harding hustle is considering using a balloon for raising a 2 meter ham antenna at least 100 feet above ground. the race is held in orange county (CA) and the net control station is located at tucker wildlife sanctuary. we have AC electrical power available on site. are you interested in helping and supporting this event with your balloon? Let me introduce myself first. I work in an advertising agency from Ecuador. We have a client who is interested in doing something big for a new product presentation. That’s why we are contacting you, in order to find out more information about your high altitude balloons. 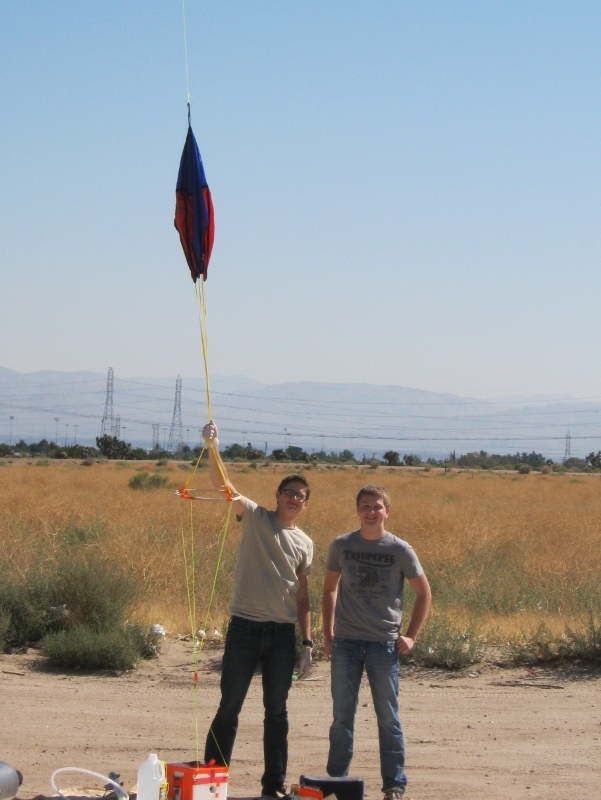 We would like to know if its possible to send a payload with cameras and recovery here in Ecuador. Also if representatives of jhabproject can come to Ecuador to perform the launching. We need to know costs If you would like to contact me, let me know. We can do it by Skype. What is the coldest you have launched? My first launch was on a nice 60 degree day in May. I am flight ready for my second launch but it’s getting chilly here in Pennsylvania am temps in the 30’s. I imagine the lower temps are going to cause me to use a lot more cubic feet of helium. And possibly change the expansion prediction of my balloon as it goes up. I have a new twin-lead jpole antenna I’m dying to launch. Thoughts? I can wait but getting ansy. Colder temps will mean you’ll have a longer float time, as it will take longer for the HE to warm and expand, however your predictions of HE volume at launch shouldn’t change. Also remember colder temps will reduce battery life significantly. You may have this link already, but one of the best predictors I’ve used is http://predict.habhub.org/ and another one which is nice for visualizing wind patterns is http://hint.fm/wind/ – Run some predictions, see what the flight path and flight duration’s will be, then I would judge the recovery time and location. All Images © 2012-2013 Ken and Josh Nagel. All Rights Reserved.